Luxury motor yacht Philosophy has superior accommodation for up to 10 charter guests in 5 individual cabins. The yacht’s main master suite located forward on the yacht’s main deck and includes a full entertainment centre with Sat TV. The master suite also boasts a ‘his & hers’ bathroom ensuite (with bath & shower) with dressing vanity area and an adjoining but sofa and separate study. Philosophy also provides a further four guest cabins on her lower deck. Two of the cabins are VIP with queen sized beds, vanity and sofas and two of the cabins are twin bedded. All of the cabins have their own ensuite bathroom facilities. This depends on the location you would like to charter. First class flights, private jets, and airport/hotel luxury transfers can be organised for you. She was designed by Don Shead and built by Brooke Yachts. With a 41.5 meter long, sleek, modern and graceful exterior Philosophy has also had the benefit of a comprehensive modernizing refit of her interior in 2003. Motor yacht Philosophy’s main saloon offers both a formal dining room forward and a more casual seating area aft for relaxing. The upper deck contains a lovely sky lounge as well as the wheelhouse. There are plenty of areas for relaxation on either the yacht’s private fly bridge or alternatively on the ample aft deck. The aft deck is also ideal for outside dining as well as swimming and enjoying the water toys from the swim platform. Philosophy is expertly captained by the very experienced 43 year old Peter McMullen and his professional and friendly crew. 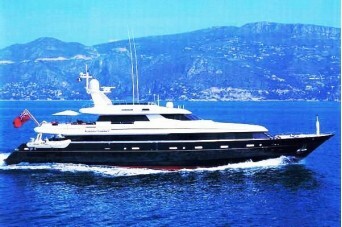 She is available for charter throughout the East & Western Mediterranean. Motor yacht Philosophy provides a fantastic range of yacht charter amenities and extras: A 5 meter and 5.5 meter Stinger semi rigid inflatable tenders - both with Honda 90 horse power engines, a two person Kawasaki XPDI wave runner jet ski, various water-skis, wake boards and other towable toys. The yacht also has stabilizers for extra comfort.